I’m not sure exactly how I came across Busy Bee Candles, although I know it must have been via Twitter. I just started following them, and I soon realised what they were all about! Busy Bee Candles are Haith and Dee, and it’s a family run business located in Wales, and they sell hand produced amazing scented candles, obviously, hence the name lol They also sell other scented home fragrance products. I’ll be totally honest, I WAS a Yankee candle addict (shock horror – it’s OK, I can say that….please read on!). I discovered them a few years ago now, and well, I loved the scents and the fact that the scent lasted right to the end of the candle….and I didn’t mind paying slightly more for the candles as a result. 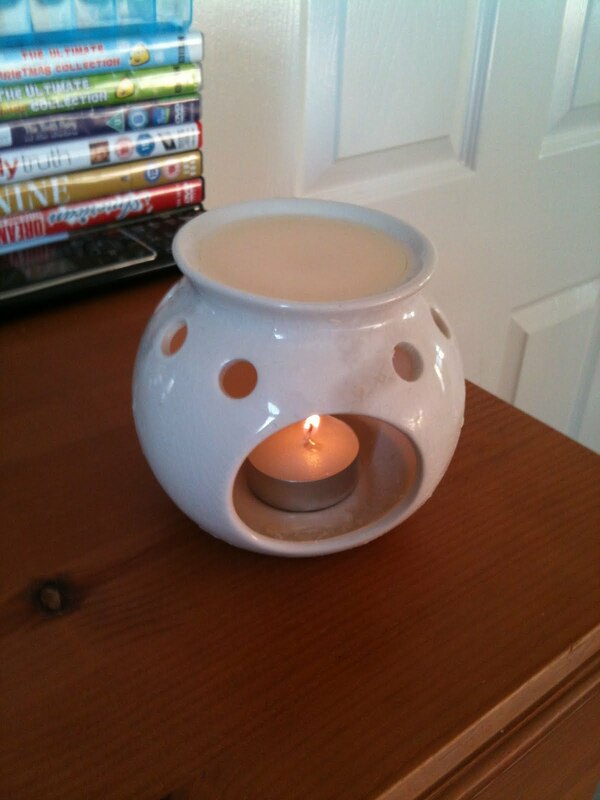 But then, after hearing the reviews from my new twitter friends, I thought I’d give Busy Bee Candles a try. They frequently run offers on Twitter (you can follow them here) so that, depending on the offer, you can get discounts, a free gift with your order, and/or exclusive offers. Plus, you know you are speaking to real people, because a) they promptly reply to your tweets AND b) they remember who you are! How is that for great customer service?! Previously, I really liked the small ‘sampler size’ candles, so I was admittedly initially a little disappointed that Busy Bee Candles do not offer these. However I was advised that a great way to try the scents are by ordering ‘wax tarts’. 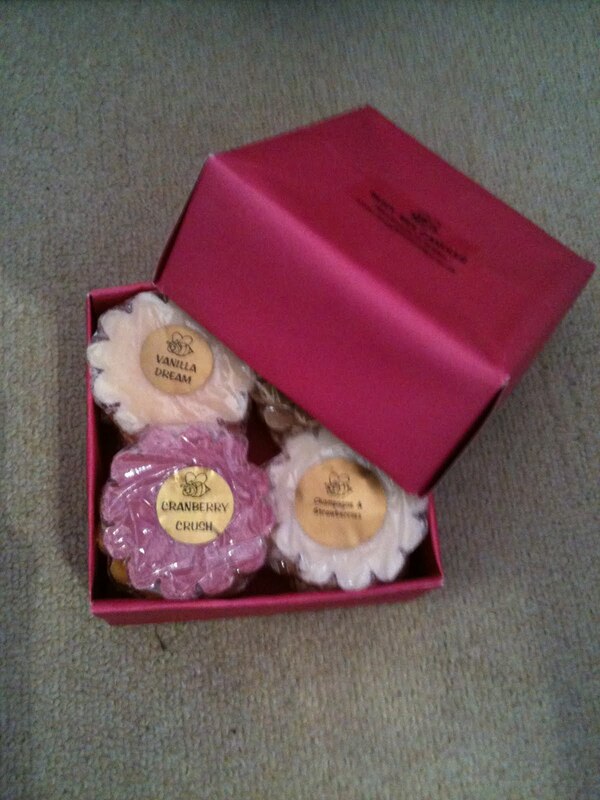 I’ve tried them in the past, but I wasn’t overly keen on them, but I was assured that these ones were different, and so I placed an order, initially for a mini candle (Chocolate Brownie) and a few wax tarts (Mango and Papaya, Vanilla Dream, Bakewell Slice, Cranberry Crush and Pink Lemonade). As you can tell by the fragrances, they have a vast array of scents. In fact the hardest thing will be chosing what scents to buy! My order arrived within a week. You need to remember that all Busy Bee Candle orders are made specifically for you, so you do have to bear this in mind when ordering….but believe me, they are so worth the wait! The mini candle, I thought was really cute, and the scent was amazing. It lasted right to the very end of the candle, and every single bit of wax was used, with nothing left over – this was a first for any candle I’ve ever used! With the wax tarts you need to place in the top section of a burner, and light a tea-light underneath. I loved the wax tarts immediately after lighting my first one – the scent again is amazing, and no word of a lie, you use four tea lights before the scent starts to fade! My favourite scent of all of the things in my inital order was the Vanilla Dream. Even P commmented that out of all the candles I’d ever lit, he thought it was the nicest one…and believe me that’s a HUGE compliment! I also think that wax tarts are a great way to sample the fragrances, as at £1.10 each they won’t break the bank, and as previously stated, they last a LONG time! The only downside of my initial order (although absolutely nothing to do with Busy Bee Candles!) was that I had only just lit the Cranberry Crush wax tart, and it had all melted, when M knocked into the table and it went everywhere. However, I can assure you that it cleaned up really well and so easily! Much better than I expected it to. So there you go, even if a bad thing happened, I learnt something GOOD from it. So, a reminder, if you DO have young children remember to tell them where you’ve got the burner lit, or better still put it where they can’t knock it over! Again, the customer service was excellent. I’ve not had the opportunity to try all of the scents yet, but I can strongly recommend both the Chocolate Strawberry and Champagne and Stawberries. And finally, the Cranberry Crush was amazing too! So, yes, I mentioned previously that I was a Yankee candle addict. But if you gave me the choice now, I would choose Busy Bee Candles every time. I love the fact that by buying from them, you are supporting a British business. The ONLY downside is that, with no local retailer here in the North East, I have to choose my scents by reading the descriptions. I am pretty picky about the scents that I like, for example I can’t stand coffee or cinnamon fragrances – but thankfully, the descriptions on the wesbite are REALLY good. I haven’t ordered one that I’ve disliked.